This exhibition let me see Asgeir Jorn compared to Munch, but perhaps more importantly Jorn and Munch in relation to the Nordic expression. The framing, Jorn + Munch is too narrow. It quite naturally open up an even wider perspective with references running everywhere, even to the work of Frances Bacon. Without the making use of the traditional, intellectual instruments Jorns paintings contains both symbolism and the intuitive message. In "The situation of a central figure" I see a Nordic "troll" version of Bacon's "The pope". Stronger, more vulnerable and even more brutal in its appearance. ! I even feel the strong presence of Nikolai Astrup in many of Jorns pictures. Together with Munchs authoritative strenght this become a show of Nordic power. “Resilience”, 2016, acrylic on mdf (30 x 20 cm) is the ultimate painting in the room. I can not free myself from the word "powerhouse" Picture frames holding the energy of the picture within. And the rest: large panels covering walls at Gallery Haaken with Ness’ manic detailed and complex shapes, forms and colours. Urban, organic, meditative, explosive. Who the hell will let their arm connect mechanically and obedient to the creative brain producing a wall of 4 meter x 7 meter (!!) with mind boggling pencil drawings forming intricate patterns in different colours? Ness will, and the result is overwhelming. The idea is to reduce the artist to a human printer or medium through which creativity can flow. And it works!! Mystic, organic and modern, sucking you into the same flow. We had a hard time untangling from Ness organic universe making an exit to the real world. Ataraxia (ἀταραξία, "not perturbed") is a Greek term used by Pyrrho and subsequently Epicurus for a lucid state of robust equanimity, characterized by ongoing freedom from distress and worry. The ancient Greek author Sextus Empiricus gave this definition: "ataraxia is an untroubled and tranquil condition of the soul." In non-philosophical usage, the term was used to describe the ideal mental state for soldiers entering battle. (From Wikipedia). Bjørn Ransve creates a space for wondering with his latest exhibition at Oslo Kunsthandel. The title of the exhibit, "Reduction and complexity", does not really serve artist or art proper justice. These prints silently confront and engage you. The artist's intention evokes reflection, opens new room for wondering. The expression is minimalistic and technically it is reduced down to the core. This opens up for creative interpretations. Perhaps one should not say too much about what happens facing Ransves nonfigurative and meditative prints. It is an intellectual and demanding encounter, and it is very much about color. Ransves mastery is as much in his use of coulours as part of the composition as his modern, abstraction. I'm left with no answer, but many good questions. And so grows the exhibition as one moves from image to image. Maybe it could have been curated a little better, but the white walls exposes pictures as exclamations. They require of everyone and everything: both wall and viewer. Bjørn Ransve never lets you in peace once he has reached your imagionation with his silent questions and wondering. He will haunt my perception for the comming days - if not forever. I think it's fair to call him "artist of artists”. “Three visions of landscape” at Galleri A, Oslo. Ending 16th of October. These paintings communicate solitude and perspective. 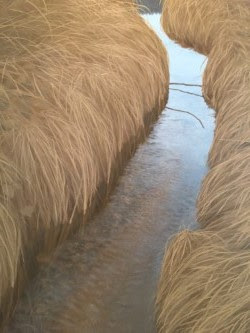 The three, male, artists: Christopher Rådlund, Jon Lindestad Bakken and Marius Moe share their observations of and about nature. Clean, beautiful, distant, solitude in toned down palette. Some motives under a looming sky, other night motives. Nature slumbering under ice, at the doorstep of winter and the coming frost or under a night light moon. Nature as we want it to be? 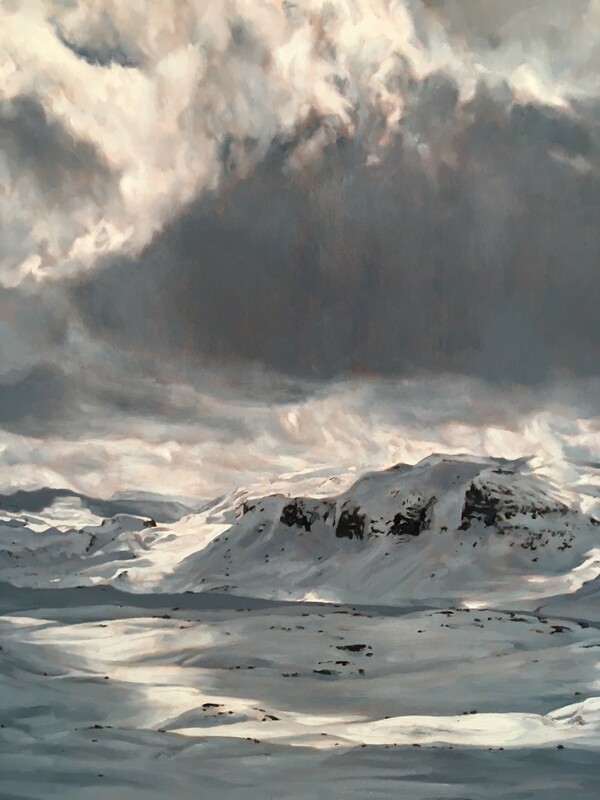 Marius Moe, "November" 170 x 120 cm, oil on canvas , detail. Beautiful. But nature can not oppose culture in a painting. It naturally becomes loaded representations. 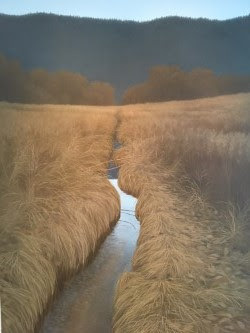 A creek running through a landscape that is both distant and near, panoramic and down to details: falling leaves, broken sticks a solitude straw. Eye lead to the horizon, attention kept on details. 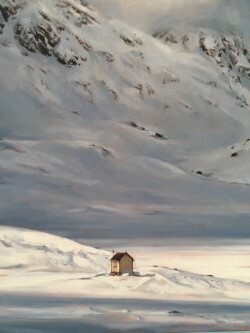 Or the cabin in the middle of the snow and ice cowered mountains. Small reminiscence of something else, breaking the monotony of unspoilt nature. Nature not untouched, nature going through change. Shifting light, coming frost or decay, a night light sky. What will happen in the next second, will the scene change or stay put? What will bring about change? Natural beauty at first glance, but looking closer I sense the constructions of inner landscapes by a closer look. Inviting, yet remote. Clean and beauty, still about to change. Pictures that apart from their beauty keep my attentions and makes the exhibit worth wile a visit. 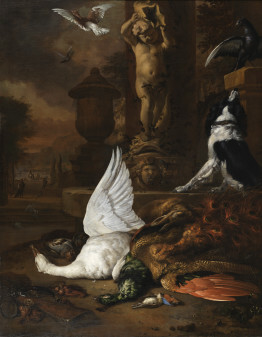 Jan Weenix, Still life with a dead swan, a peacock and a dog next to a fountain, 1684.Photo: Anna Danielsson/Nationalmuseum. The Nationalmuseum has acquired a large, masterfully executed game still life dating from 1684 by the Dutch Baroque painter Jan Weenix. The painting represents dead game placed next to a sculpted fountain in the shape of a putto. The canvas formerly belonged to the Swedish diplomat and collector Karl Bergsten and has now been reunited with those parts of his extensive art collection previously in the museum’s holdings.